Welcome everyone to Terminal #3! Julia here with a Destination Inspiration Post. Every Monday one of the AVJ Creative Guides is here with a travel bag of supplies she must use to create something. Here's what our travel bags contain for February. I found a package of 5"x7"burlap bags in my stash - and knew it would be the perfect base for my creation! Here's how I put this together. First I put a piece of cardboard inside the bag to keep the spray stain from going through to the back. I laid the Scribbles stencil over the bag and sprayed it with Fired Brick Distress Spray. I removed the stencil and here is the result. I like the little edge of spray on the right that happened! 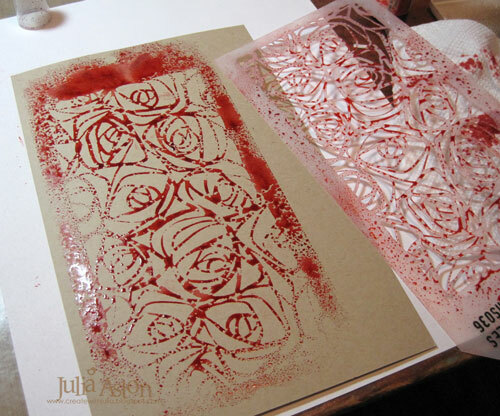 I didn't want the stencil centered - and this bit of outside spray gives interest without being too busy! 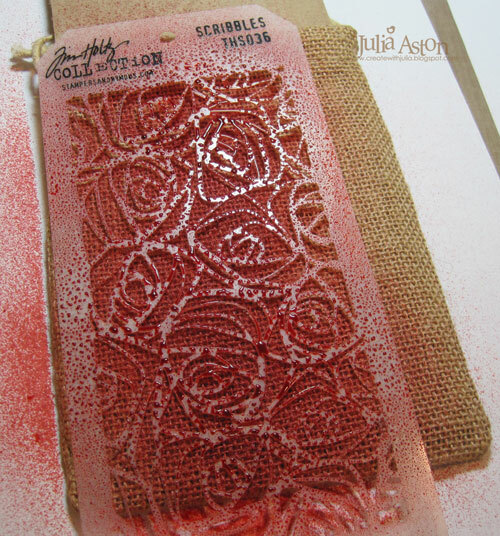 There was a lot of stain on the top of the stencil so I took a piece of Kraft cardstock and laid the inky side of the stencil down onto it and pressed over the stencil with a paper towel. I removed the stencil and it left this great negative print! I dried it with my heat tool. I started gathering things I wanted to put on my bag. I die cut the piece of stained kraft card I made in the photo above using the Artful Dwellings die and used one of the pieces to make a sort of tag for the bag. I die cut the Thinlits 'getaway' out of black card and adhered it to the tag and sponged the edges of the tag with Ground Espresso. I used a Loop Pin to pin the key and tag to the bag. I also adhered the tag and key with adhesive - I put the cardboard piece back into the bag so as not to have the glue go through to the back. I attached the Word Band to the bag with a loop of Black Paper String on each end, tying a knot and trimming the ends - again being careful not to catch the back of the bag in the stitch. I added Chit Chat and Small Talk Stickers, a wrinkled seam tape bow and stitched the key to the bag as it is heavy and flopped around without the stitch! I rubbed Ranger Fired Brick Acrylic Distress Paint over the Word Band - heated it to dry - then sanded off the top - then I sponged Ranger Distress Ground Espresso ink over it. 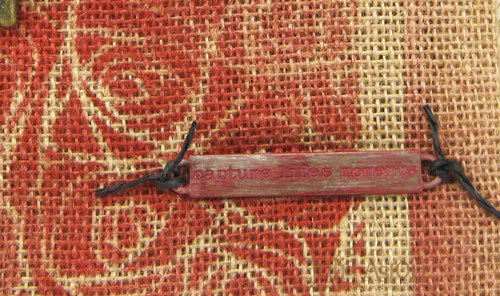 It says "capture life's moments" and is tied onto the front of the bag with Black Paper String as described above. I hope I have inspired you with my Destination Inspiration project using the supplies in my travel bag today. 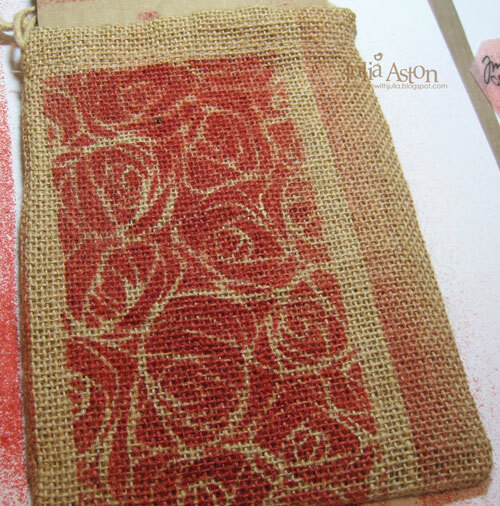 I think this burlap bag will make a nice place to put photos or mementos from a trip! There will be one more Destination Inspiration for February next Monday. If you missed the first two - you'll find Terminal #1 here and Terminal #2 here. And a reminder - there's still time to join in in the February A Vintage Journey Challenge - Jennie is our host and her challenge is 'Words that are Special'!. Such a wonderful work Julia! Briliant Julia, love how your little bag turned out! The background with the stain looks super and I totally love how you embellished it! Such a clever way to use the artful dwelling die! 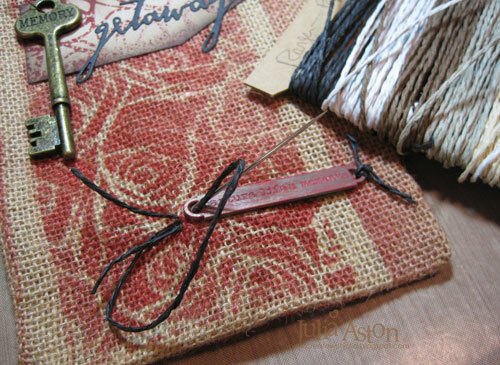 Just love how the stencilling looks on the burlap - a really great rustic look - and yes, I also really like the "stripes" of colour from having the stencil off centre - fab detail. A delightful little bag, and great use of the travel bag contents. Great use of the travel bag products! 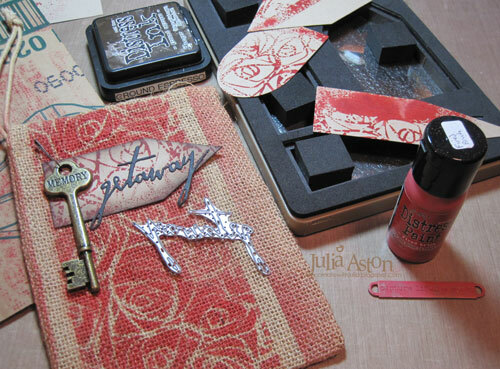 The stenciling looks fantastic, and I love that you used the leftover ink to make your tag. 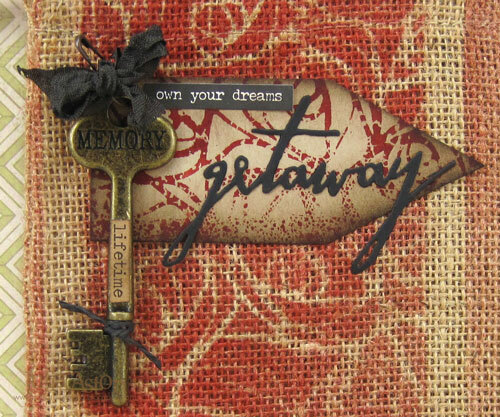 Great choice of embellishments and clever to add the chit chat sticker to the word key! This entire project has a lot of wow factor! This is an awesome project, Julia! TFS all your steps Julia. 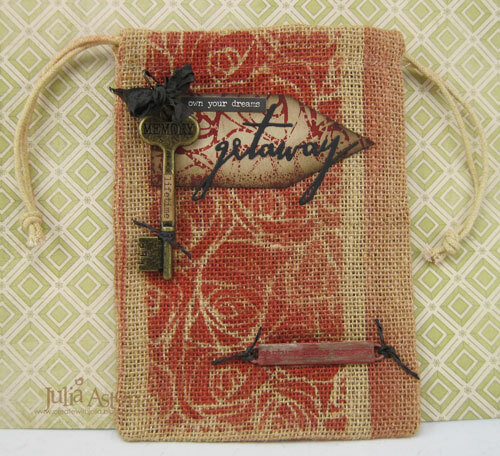 I love your amazing mixed media burlap bag and your wonderful embellishments. Hugs..